Around 2.9 million Libyans are voting on 7 July to elect a General National Congress as part of efforts to create a new political system after the toppling of Muammar Gaddafi. This is Libya's first nationwide election since Col Gaddafi was toppled in 2011. It also follows local polls held in several Libyan cities earlier in 2012. The four decades of Col Gaddafi's rule were marked by an absence of party politics, and the lifting of his ban on political parties triggered an explosion in their number. The election reflects the stark change since the end of Col Gaddafi's era, but is also affected by his legacy. It is being held following a postponement from June, and while there are concerns that continuing violence could disrupt the polls, Higher National Election Commission Chairman Nuri al-Abbar is adamant that there will be no further delay. What is the congress' role? The upcoming General National Congress (GNC) will replace Libya's National Transitional Council (NTC), the country's interim legislative body that was established days after the beginning of a popular uprising against Col Gaddafi. Once formed, the congress is due to elect its chairman in its first session. It will have to appoint a new prime minister within 30 days of that session. The congress had also initially been charged with forming a body to draft a constitution and oversee a referendum on the draft. But in a last-minute attempt to defuse pre-election tensions, the NTC ruled that the constitutional panel would be elected by a direct vote. The congress is also tasked with announcing the results of the planned parliamentary election, which is expected to be held at a later date. Libyans will elect the congress from some 2,600 individual candidates running in different constituencies. The vast majority of them are independents, while almost 400 represent political parties. Some parties are contesting the election across several constituencies, with most fielding several candidates in each constituency they are contesting. Each candidate, however, appears to only be allowed to run in one constituency. Even though it is difficult to judge who is likely to do well, party candidates tend to be more influential and recognizable than independents. One of the most high-profile figures is former Tripoli Military Council chief Abdul Hakim Belhadj, an Islamist who is running as a candidate of the Al-Watan (Homeland) Party in a Tripoli constituency. Other parties with prominent candidates include the Alliance of National Forces, which is led by former leading NTC figure Mahmoud Jibril, and the National Front Party, which is the political incarnation of the former opposition National Front for the Salvation of Libya. 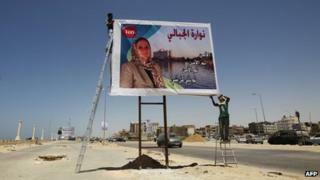 The Libyan Muslim Brotherhood's Justice and Construction Party is also contesting the election. Although the Brotherhood was banned under Col Gaddafi, it survived as a clandestine movement. Union for the Homeland is another party whose candidates are running in a number of constituencies. It is led by Abdulrahman al-Suwayhili, who reportedly began his opposition to Col Gaddafi as early as the 1970s. Since many officials from the previous regime are either on trial or wanted following Col Gaddafi's removal and death, his supporters are keeping a low profile and not contesting the election. Turnout is expected to be high, as reports suggest that nearly 80% of eligible voters in Libya registered to cast their vote. Libyan television stations have been showing public awareness films about the elections in the months leading up to the vote. There have also been calls to boycott the election. On 3 May the "Council of Cyrenaica", a group which is seeking autonomy for Libya's eastern region of Barqa, called on its followers to shun the vote. The absence of party politics under Col Gaddafi and the dramatic change since his downfall mean that it is difficult to predict how Libyans will vote or even what will inform their choice. Many parties were only formed in the months leading up to the elections, and it is sometimes difficult to find much information about candidates' platforms. Public opinion polls have not yet been carried out in any part of Libya. However, Libya's political scene currently appears to be dominated by the key leaders in the anti-Gaddafi uprising, such as Mr Belhadj and Mr Jibril, Gaddafi's long-time opponents, as well as Islamists.